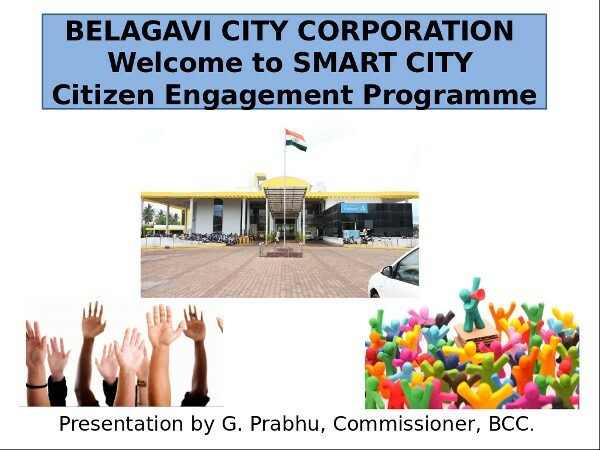 The Belagavi Corporation Commissioner G Prabhu has shared a presentation on Smart Cities, which gives a clear idea on what a smart city is and what it needs to be like. Double Road from Globe Talkies is to be extended upto Central Bus Stand to reduce travel time Tilakwadi to Bustand and also to provide another alternate route to the bus stand and also for free movement of traffic as well as provide city bus service to old belgavi areas like patil galli, fulbaggalli, Tahsildar Galli, Bhandur Galli, kulkarni Gall, Sheri Gall, Math Galli, Anantshaayan Galli etc .These areas do not have any city bus servce and very congested . Surrounding hillocks of Bagewadi, Siddheshwas, Ramtirth( which are extended upto Highway) which had lot of greenery are to be replenished with fresh plantation to keep Belgaum cool and to bring more rain to the city . Improvement in Transportation ( city bus) & Roads, proper auto Rickshaw system, Renovation of Airport, & improvement of Railway station,markets & Traffic flow system….